Hai Phong (VNA) – Party General Secretary Nguyen Phu Trong attended the festival of great national unity in Thuong Dien cultural village in Vinh Quang commune, Vinh Bao district, the northern city of Hai Phong on November 15. The event was meant to celebrate the 87th anniversary of the Traditional Day of the Vietnam Fatherland Front (VFF) (November 18). 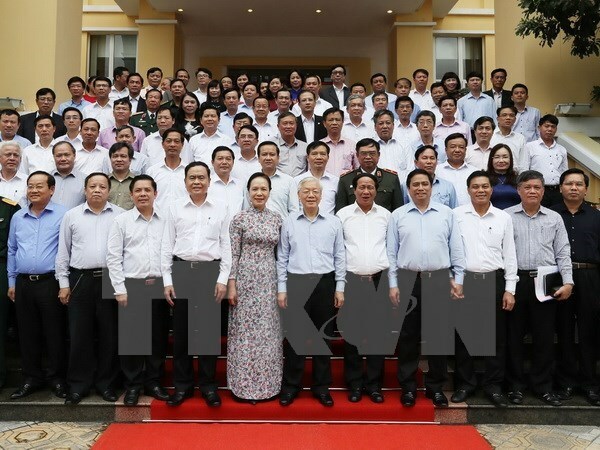 Together with local residents, the Party chief reviewed the glorious tradition of the VFF since its establishment, lauding its great role in gathering patriotic forces, classes, ethnic groups, religions and people from all walks of life in the fight against invaders and the national construction and defence. He praised the VFF for initiating the event to uphold the spirit of solidarity among the public. The leader expressed wish that the entire Party, people and army would stand united under the leadership of the Communist Party of Vietnam and the direction of the government to build a prosperous, democratic, equitable and civilised country. Tran Van Pha, Secretary of the Party Committee and head of the Front Committee of Thuong Dien village said the average income per capita in the locality reaches 36 million VND (1,600 USD) per year, up 9.1 percent from 2016. The rate of poor households under multi-dimension standard was reduced to 2.9 percent last year. On the occasion, the Party chief presented gifts to six poor households in the village.